This Distressed Nine Picture gives a classy interior decor photo accessory. 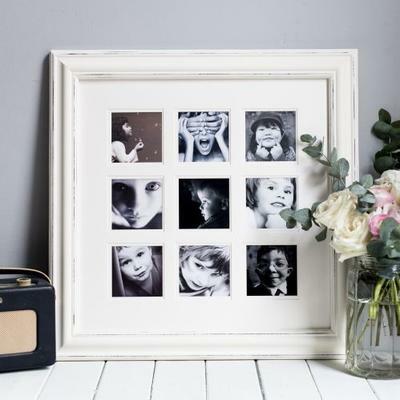 The beautifully distressed white frame lends it a vintage feel that is accentuated by the nine black and white apertures. Each of the 9cm x 9cm apertures are squarely set in double recessed mounts for even greater effect. The overall feel is rustic and genuine, great for classy interior design. This item is sold and dispatched directly by The Orchard.